In a cave on the beach near our house. Used the 580Ex flash after a tip from ladymonarda and micknewton. Adjusted Exposure, Contrast and White Balance in RAWShooter. USM, Crop and Resize in PS. Thanks to everyone for their comments. Always very happy and honoured to win a ribbon at DPC. just been looking thru your work again owen, and just had to say that i love this image .. the sky is amazing, the water and reflections beautiful.. congratulations on a 3rd place and an awesome photograph .. It's nice to find beauty without having to look very far. Cool shot! Amazing capture. So beautiful. Congrats on the fine finish too! Congratulations on your Yellow. Quite a romantic and iddylic feel to this wonderful image. That sky is just an amazing sight. Congratulations on yet another ribbon my friend. Doing some fine work recently. Congratulations on your Ribbon with this beautiful shot! Congrats on your ribbon, just beautiful! Congratulations on your ribbon! Great shot! Nice shot, the centered composition really works here, well deserved ribbon mate! Congrats on the yellow...Beautiful photo! Well done Owen. 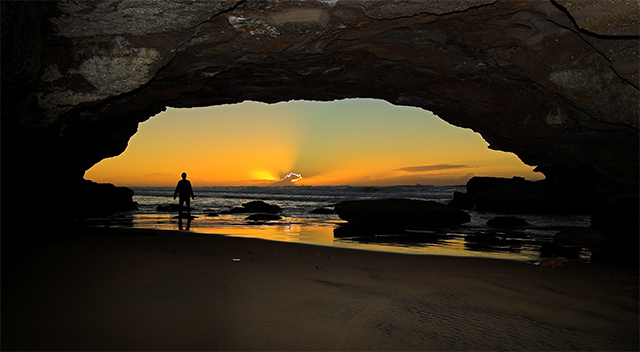 I love Caves Beach we quite often make use of the cave in the summer holidays. I think I'll come stay at your house next time I'm in Australia. ;-) Congratulations - a fantastic shot. Congratulations on the ribbon and the wonderful photo Owen! Really lovely. Congrats on the ribbon!!! Spectacular framing of a dramatic scene. You should do well in this challenge. 6 - Good. A more finely tuned crop at the top, minimizing the fill-flash effect (apologies in advance if it is not fill-flash), make this better in my opinion, as well as some tweaking in pp for added drama/depth, though I realize difficult in basic. Gorgeous! Love those sun rays behind the cloud! Wow. I might have croped out most of the interior of the cave. The detail seems to just be distracting. I really like the silhouettes of the person and the rocks and the reflection off the wet sand. I like how you have managed to keep some detail in the roof of the cave. gorgeous shot! love to be there!! less rock around the outside of the frame would maybe make this a stronger image, great sunset colors and silhouette. This is really beautiful, great framing and colours. Pretty sunset, and the figure gives the whole picture scale - both the frame and the enclosed seascape. Great composition & color. Lighting is great. Nicely framed slice of paradise, beautifully exposed for the wonderful sky. The inclusion of a human silhouette is what makes the shot. Excellent.. I like it a lot. I would have preferred two steps forward for a even better pic maybe. Awesome shot. Perfect lighting on this... truly captured the essence of the challenge (and the scene). Nice job. Proudly hosted by Sargasso Networks. Current Server Time: 04/20/2019 02:14:13 AM EDT.